4237176 Bohrok Shield is a large foam BIONICLE shield released in 2004. The Bohrok Shield is comprised of foam, and features printing and design analogous to those used by the Bohrok-Kal, Tahnok-Kal. On the shield's underside is a small strap which can be gripped so as to allow the user to "wield" the weapon. This is a description taken from LEGO.com. Please do not modify it. (see an archive of the product's page) Play with BIONICLE®! 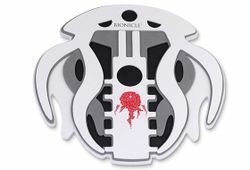 Look out for your opponents and use this Bionicle shield to defend yourself. The shield is based on those wielded by the Bohrok-Kal and Tahnok-Kal. The set was released in 2004, one year after the BIONICLE storyline involving the Bohrok-Kal began and ended. Facts about "4237176 Bohrok Shield"
This page was last edited on 9 January 2016, at 16:05.